There are many ways to afford college! The estimated cost of attendance (or the "sticker price") of a college is not the amount that the majority of students pay to attend. Don't let that cost scare you away from considering a college! See your school counselor early on to discuss ways of accessing various types of monetary aid including scholarships, merit-based aid and federal financial aid (loans, grants, and work-study). You can start applying for scholarships before your senior year! Scholarships are available for all kinds of students. Some are merit based (based on your academic performance) and others are based solely on your background demographics, involvement (clubs, honor societies, community organizations, etc), leadership, and so much more! And some are available for anyone to apply for regardless of the aforementioned criteria. There are always people out there that advertise fake scholarships as a scam. Click here for tips to avoid this. RCHS also promotes MANY local scholarships throughout the school year. We strongly recommend that students and families sign up for our College and Career Weekly newsletter to receive this information on a weekly basis. Click here for more information about our local scholarships. You may receive scholarships in the form of Merit Based Aid from the college you plan to attend based on your academic performance, SAT/ACT scores, etc. This information is usually available on each college's specific website. Some require separate applications whereas others are provided automatically when you apply for financial aid. National Merit Scholarship Program (NMSQT): High school students are eligible for a monetary award when they take the PSAT/NMSQT in their junior year. Awards are given to students that score exceptionally well on the PSAT/NMSQT. This is why it is important to begin preparing for this test before junior year! Click here to view a presentation about the PSAT/NMSQT created by Mrs. Burkhardt which provides information about eligibility for the National Merit Scholarship Program. To apply for federal student aid, you will need to file a FAFSA. See the "FAFSA Info" page for more specific information about how to file your FAFSA and the deadlines for filing. 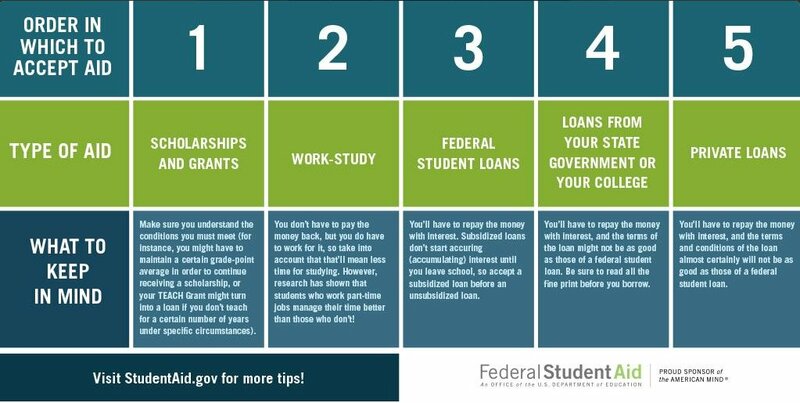 There are many different types of federal student aid. You will complete the FAFSA to be eligible for all of the types of aid listed below - there is no need for separate applications. Work-Study: Students at are awarded work study are eligible to receive this money as part of a work study job. You are not automatically awarded this money - you must have a job in order to receive it. Your college will have many different jobs available for work study (i.e. working in the dining halls, conducting research, working in an admissions office, being a campus tour guide, and many more!) and you will receive this money just as you would be paid for any other kind of job. There are usually many work-study only jobs available on campus and they are usually very flexible with student schedules.